THIS DOG IS NOT AT THE LAP SHELTER. WE ARE HELPING TO REHOME HER DIRECTLY TO HER FOREVER HOME. Stella is five years old, spayed and UTD with all vaccines. 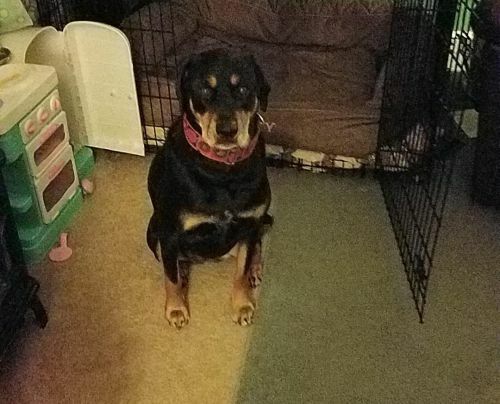 She is a lovely mix of Rotti and Tan Coonhound. She is dog and child friendly. Prefer older children due to her 90 pounds. She is well trained on commands and tricks. She is also crate and potty trained. Stella is low energy, gentle and extraordinary couch cuddler. Currently lives with a Great Dane and a two year old child. Her owner wants to rehome because she is a single parent and cannot give the attention to Stella that she needs. A LAP volunteer is helping to rehome. If you are interested please call or text, Paula at 540-521-5839 for more information and a meet and greet.